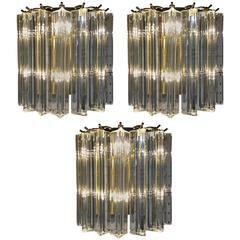 Italian Murano glass smoked Venini sconces. This “triedi” style pair by Venini features chromed attachments and structure. A smoked strip of glass is fused into the clear crystal glass, providing the right hint of color. This pair has been newly wired for US standards. 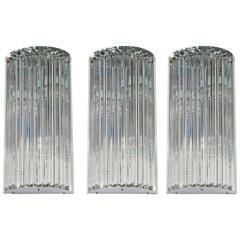 Atemberaubende italienisches Mid-Century Modern sconces von Venini. Mit einem Messingrahmen und schöne Glasprismen. Jedes der Prismen sind feste Glas, Mess 11 Zoll pro. Drei verfügbar. 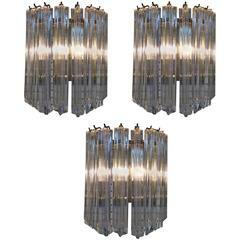 Venini Pink Sconces Tony Zuccheri, 1950 Italian Murano glass (Corteccia) brass.